CoinBar elegantly keeps you up to date with current crypto currency market prices on the touch bar of your MacBook. We are currently giving away the Lite version of CoinBar which allows you to see the current top 10 crypto currencies and their prices. You can quickly change from White to Colored icons by using the status bar app. CoinBar works differently from other applications that utilize the new touch bar on the Mac Book Pro. CoinBar adds an icon to the right hand side of the touch bar known as the control strip. This allows you quick access to current market prices. The other cool thing about CoinBar is that it is always present on your touch bar even if you open another application, until you decide to minimize it by tapping on the X on the left hand side of the touch bar. Here’s what CoinBar looks like when its minimized, notice the blue icon on the right side of the touch bar in the control strip. Here’s another screen shot of CoinBar, this is what CoinBar looks like when you tap on the blue icon. CoinBar will be present on your touch bar until you tap on the X on the left which will minimize CoinBar until you press the blue icon again. Here’s a screen shot of CoinBar using white icons instead of colored ones. 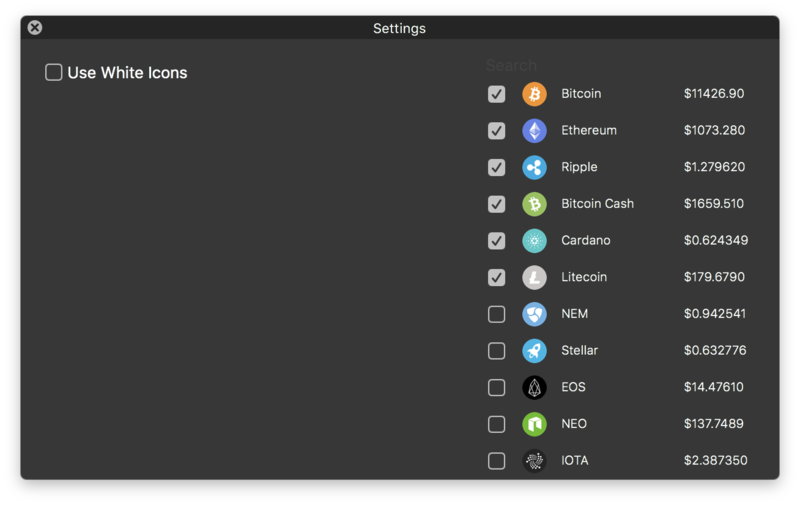 Below is an early version of what the settings pane will look like in the paid version of CoinBar. The settings pane will allow you to pick your own coins to display on the touch bar. We are currently working on making this feature simple to use and navigate. Coin Bar Lite is available now as a free download. The paid version of Coin Bar will be available in the first half of February 2018.